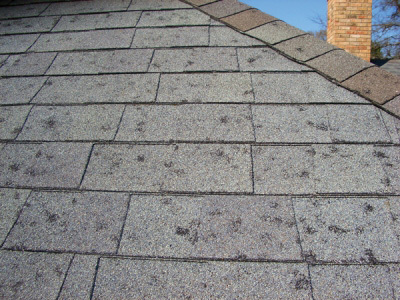 Your roof damage in Denver requires immediate and expert repair. Call now. Your equipment, furnishings and tenants are too important! Trust a respected local roof contractor with three decades of experience. We expertly repair roof damage in Denver Workmanship warranty! Call 303-294-9535 We will work with your insurance adjuster. You should call as soon as you suspect storm-related problems with your roof. The problem is that damage may not be visible or the trouble will reveal itself later. You will find us to be very responsive. Get us up on your roof. We will secure your building and fix what’s wrong. • Hail causes a lot of harm to roofing materials. Our state can count on three to four catastrophic hailstorms a year. • Hailstones can travel up to 90 mph. They can dent metal, crack brittle coverings, and scour granules off of asphalt shingles. • Colorado has the most hailstorms in the nation and among the highest number in the world. Chances are high that your roofing will be affected at some point in its lifecycle. • More than half of an average insurance premium goes toward hail coverage. Call now. We’ll assess your policy and if you have a claim, we’ll handle it. If you have roof damage in Denver, do you know what your property insurance covers? We have extensive experience handling claims with insurers. We speak their language, and are experts at finding common ground with adjusters. You can rest assured they trust our judgment because we work strictly by the book. You don’t have to fight with your insurer – let us handle it. Sometimes roofing is damaged, but you will not know it for a long time. Water can intrude in stages, over a long period of time. Hail damage may not be visible from the ground. Loose edges must be checked by hand. Call for a no-obligation inspection – the kind your maintenance people may not know how to do right. • Let us check your seams, parapets, gutters, granular coverings, and shingles or tiles. • You will have the information you need to budget for capital improvements with confidence. • Windstorms can rip old shingles or single-ply membrane sheets clean off. • Rain can enter weak seams, or be pushed under the surface by wind. • Snow can collapse a weakened roof, or as it melts cause ponding. Both businesses and residents fall prey to “storm chasers”, who urgently insist you must replace your roof – whether or not problems actually exist. They do shoddy work. These folks have even been known to fake hail damage with a ballpeen hammer! When their work is done, they disappear – long gone to another town, seeking more victims. Don’t take the risk. Call now if you have suffered roof damage in Denver. We know the area – and are known in the area for quality work. • You will be doing business with an honest company that offers a five-year warranty on workmanship. • Most of our roofers have been with us for more than a decade. You will never have to worry about who is working on your building. • We have been your neighbors since 1984 and in the same headquarters since 1994. That kind of stability counts! • You can trust our credibility that is underscored by our active membership in the National Roofing Contractors Association, the Colorado Roofing Association, and the Better Business Bureau. Honesty, integrity and decades of experience. Call now at 303-294-9535.